It is the dead of winter but the rice fields outside of Knights Landing are full of life. Traditionally, this is the slowest time of year for the farmer as his crops have been harvested and he typically would be found patiently waiting for the spring planting season to begin. But, at River Garden Farms, this has become a time when they are producing a new type of food. The rice fields, once left dormant during the coldest time of the year, are now used to help produce billions of bugs. Roger Cornwell, the General Manager of River Garden Farms, knows there isn’t any money in growing tiny insects, but he’s banking on it leading to riches in another sense. An abundance of salmon. The spineless orange bugs, known as cladocerans but also called a water flea, are no larger than a grain of rice, but they are the preferred meal of California’s Chinook salmon. Partnering with U.C. 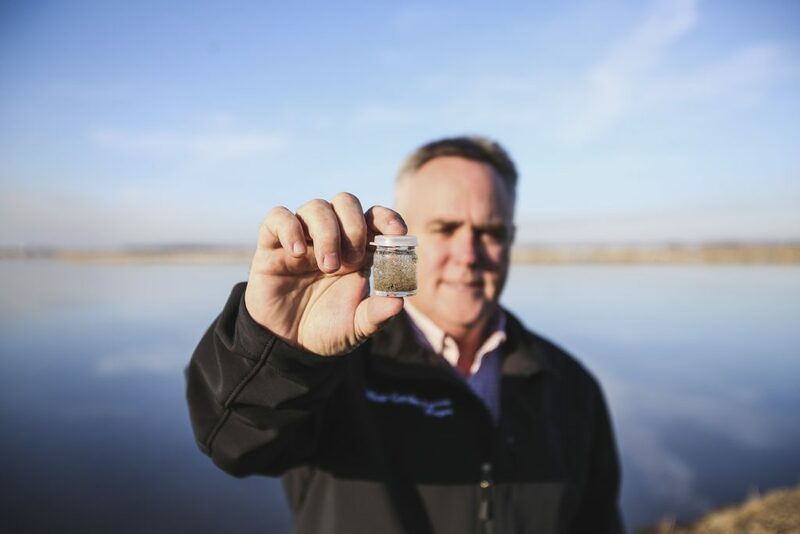 Davis, Cal Trout, the San Luis and Delta Mendota Water Authority, the State Water Contractors (and many others), Cornwell is hoping these tiny crustaceans thriving on his rice fields can lead to a rebound of the salmon’s declining population numbers. But on the rice fields, the bugs reproduce enthusiastically as shown on the 3-minute film you can click on here. “When the fish are able to eat these insects found on the rice fields, the salmon grow three times the size of their counterparts who are forced to only eat what’s currently in the river,” said Cornwell. The increase in size has earned the fish the nickname floodplain fatties. In the marine world this is a positive indicator for survival. Growing stronger, more agile and with the ability to prevail when food supplies are low, the salmon increase their chances of making it to the Pacific Ocean. But there is a problem, the fish can’t swim out onto River Garden Farm’s rice fields. So Roger has teamed up with scientists to create a Blue Apron-style food delivery for the salmon. The insects are able to reproduce at significant rates once sunlight breaks down the remaining rice straw turning it into algae. The bugs feed off the algae and after a few weeks the water is drained into the river for the young salmon who then engage in a chow down that would make Joey Chestnut seem like an amateur. It is there in the upper channels where you will find River Garden Farms’ second significant project to help salmon. 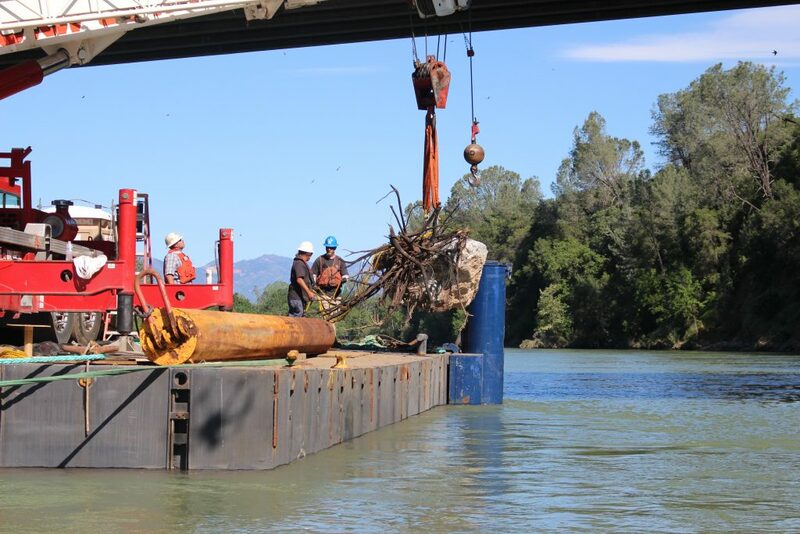 Located on the edge of Redding, Cornwell has partnered with scientists, Northern California Water Association, National Marine Fisheries Service, Western Shasta Resource Conservation District and the US Bureau of Reclamation to provide salmon fry with shelter from larger prey. Using walnut trees bolted to granite boulders, the 25 structures serve as protection from the swift current and larger predators. The program is already showing great progress. Natural resource scientist Dave Vogel reports he is discovering a record-breaking number of fish passing underneath the Bonnyview Bridge. For Cornwell, the efforts won’t stop with these projects. He says he believes River Garden Farms is just getting started and there will be many more efforts for Sacramento Valley salmon recovery. 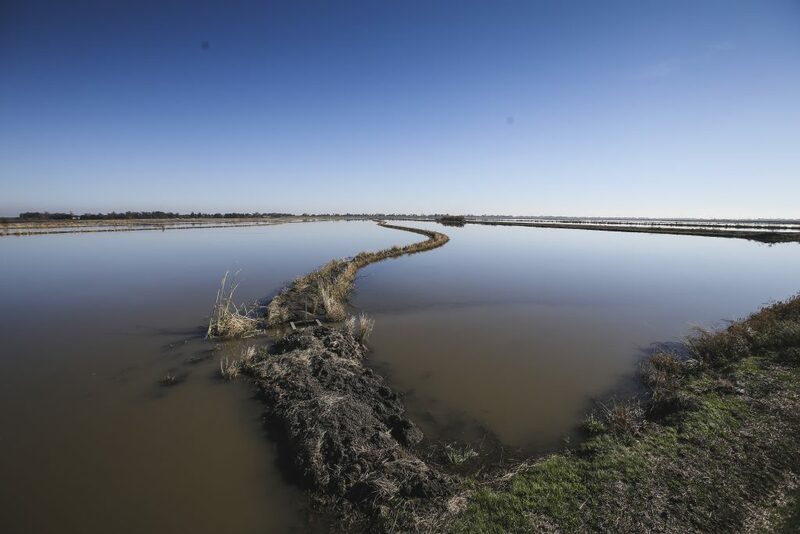 So next time you see a flooded rice field in the middle of January, it may just be a farmer in the middle of his bug-growing season. For two other short films, see the links below.